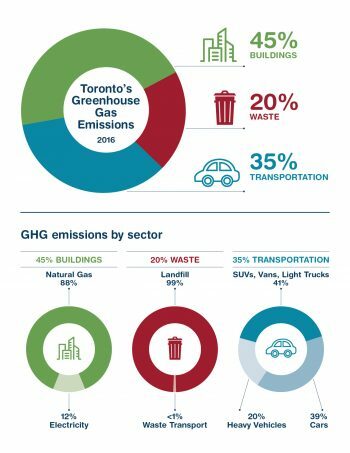 The City’s 2016 inventory on community-wide greenhouse gas (GHG) emissions – which measures the emissions from energy use in buildings, vehicles, waste and industry – indicates that GHG emissions in Toronto were 33 per cent lower in 2016 than in 1990, which puts the City half-way towards its 2030 GHG reduction target of 65 per cent. Reporting annually is part of the City’s commitment to address climate change, and inform the development of its climate strategy and policy. A full dashboard of the 2016 GHG emissions inventory is available on the C40 Cities website. C40 is a network of the world’s megacities committed to addressing climate change. The City follows the Greenhouse Gas Protocol for community-scale GHG emission inventories. Learn more about data visualization, projected emissions and conduct your own analysis and research using the CityInSight Visualization Tool.